When you visit us you will not only experience world class luxury and accommodation, Addo Elephant Park offers some of the best game viewing in South Africa. 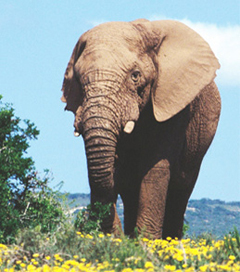 Addo has the densest population of elephant in the world and guests at Woodall also have the unique luxury of choosing from a range of different safari experiences in the surrounding wilderness. Experience game at close quarters and indulge in magnificent scenery at Addo Elephant Park from Woodall’s comfortable game viewing vehicle. Game viewing tours are guided by highly qualified staff whose passion for the Addo Elephant Park is inherent and infectious. After a day of game watching under the African sun retreat to our Addo Elephant Park accommodation and laze around the full size pool, fringed with palms and a waterfall; or take a moment to sit peacefully on the expansive sun-downer deck and view the antics of abundant South African waterfowl. Snacks are served daily at sunset. Other facilities include a lounge with satellite TV and fireplace, library, CD library, curios, wi-fi internet and fax facilities. The establishment was developed from the original farmhouse built in the early 1900’s and the charming ambience and character of yesteryear still permeate the atmosphere of this Addo accommodation. Old world attention to detail blends seamlessly with contemporary African luxury and style as reflected in the raw, earthy Eastern Cape architecture. This award-winning Addo elephant park accommodation caters for the discerning traveller by offering five star luxury and standards of service, reflected in attention to detail and spacious accommodation.